Sky is the most popular pay-TV provider and satellite service in the UK. Although best known for its range of television channels, it’s possible to listen to digital radio with Sky. There are more than 50 digital radio stations on the service. Sky users can already access the full range of radio channels through their Sky digibox, regardless of receiver type and subscription. Freesat from Sky users can also access the same line-up of channels. Radio channels on Sky can be accessed through the TV guide or directly with a channel number. To listen to radio through TV Guide, press the tv guide button on the top of the remote control. Press select to enter the TV Guide, then the left button twice to see the list of radio channels. Press the down button to scroll through the radio channels, then select to listen to the chosen radio station. Alternatively from any TV or radio channel you can enter the number of a radio channel, if you know it. We’ve compiled a full list below. 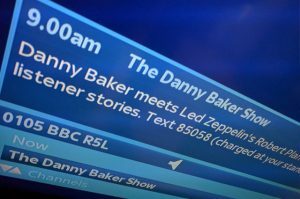 Unlike DAB digital radio there isn’t scrolling text with additional information, such as the name of the currently playing song or the next programme. General information about the current on-air programme or station is shown. The audio quality of radio channels on Sky is very good. Older Sky receivers have analogue RCA (phono) out connections so that an amplifier or hifi system can be used to listen to radio channels with the television switched off. Newer Sky+HD receivers and Sky Q boxes have an optical audio output. Freesat from Sky is a digital television platform which uses Sky set-top boxes to receive free television and radio channels. The service can be purchased for £254 including installation, or a viewing card can be purchased for £25 if equipment is already installed. As all digital radio stations on Sky are ‘free to air’, i.e. available for free without a subscription, the line-up of radio channels is the same as with a Sky subscription. There are more radio channels on Freesat from Sky than Freesat or Freeview. Around 55 digital radio stations are available on Sky and Freesat from Sky. All of the BBC’s national and regional services are available, but not the BBC local radio stations. Popular radio stations including Heart, Capital, Kiss, Magic and Radio X are available in addition to digital only Planet Rock, Absolute 80s and Jazz FM. The newest national radio stations, such as talkRADIO, Mellow Magic and Virgin Radio, are not currently available via satellite.